A few weekends ago, Kevin and I took a trip down to Key West. It was my first time driving through the keys and visiting the "southernmost point in the continental USA". It's charming and picturesque. And loaded with chickens. But as lovely as Key West is, my ulterior motive for going there was to visit Fort Jefferson in the Dry Tortugas. Any Lincoln Assassination buff worth his salt will know that Fort Jefferson was the prison where 4 of the Conspirators were sent to initially serve life sentences due to their flimsy participation in both the assassination and/or the failed kidnapping plot that never actually occurred. One of the conspirators actually died on the island of yellow fever. Perhaps the most famous prisoner was convicted conspirator Dr. Samuel Mudd. Visiting Fort Jefferson would culminate my passion for visiting every site and location that had anything to do with the assassination. I've lost count of the number of times I've been to Ford's Theater and the Peterson House. I've visited the Surratt Tavern and Dr. Mudd's House, and I've traveled the escape route several times. I've even visited Tudor Hall, the boyhood home of John Wilkes Booth. But the one place I never ever thought I would get to see was Fort Jefferson. Set on a small island about 70 miles off the coast of Key West, the Fort must be accessed by either boat or plane. For me, being there was something unimaginable. To be in the same spaces and see the same views and feel the same walls - it's why history is so exciting for me. And the assassination story and the people involved will never stop fascinating me. It's a feeling like I described when I visited John Wilkes Booth cemetery plot this past summer: that when I stood on his gravesite, despite him dying 101 years before I was born, I was now just 6 feet away from him. That's what gives me goosebumps about history. I could give you lots of details about Fort Jefferson and our visit, but I will direct you to my friend Dave's website, BoothieBarn. I took some photos that he posted so that everyone with the same interest could enjoy. However, I will post here the video that Kevin created for me. This really means something to me. It's haunting and lonely and desperate, which is how I imagine the Conspirators - or any prisoner sent to this desolate place - would feel. 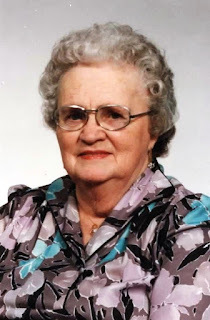 Had she lived, my maternal grandmother would be 104 years old tomorrow, December 14th. She died in 1987 at the age of 77, and I've spent the last 36 years hoping that I've made her proud. My mind is full of what-ifs. When I was a boy, I spent just about every weekend with her at her house, usually just the two of us. I'd watch TV and she would sit in her big recliner and read or crochet. I still have the hat she made for me when I was 10. It was during the country's 1976 bicentennial, so she made it red, white and blue. On really cold days in Chicago, I'd still wear it. Nothing kept me as warm. I carry her spirit with me every day. She was my hero and my champion. And especially every December 14th, I miss the woman I loved so much. The melted plastic popcorn decorations were popular in the late 1960's through the 1970's and are enjoying a kitschy-cool comeback as vintage collectibles on Ebay and Etsy. Original pieces were made by The Kage Company, Inc., a plastic fabricating company in Hartford, CT. The Kage Company went out of business in the mid 1970s and finding information on them is very difficult. Fortunately, it is still very easy to find your favorite pieces online from individual sellers. They're called melted popcorn plastic decorations because they look like melted plastic shaped like popcorn. 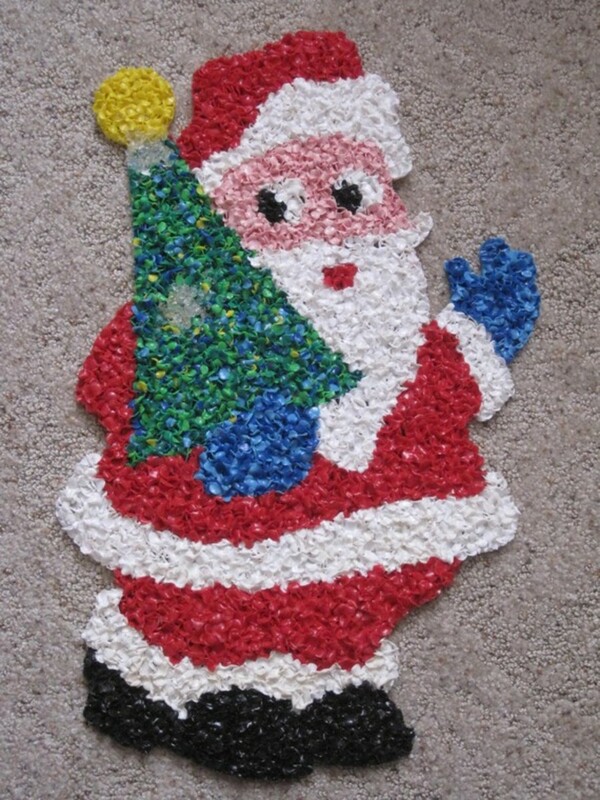 Older decorations, circa 1960, have edges that are not as flat and smooth as a newer melted plastic popcorn decoration. Melted plastic popcorn decorations can been found in many shapes for the holidays. 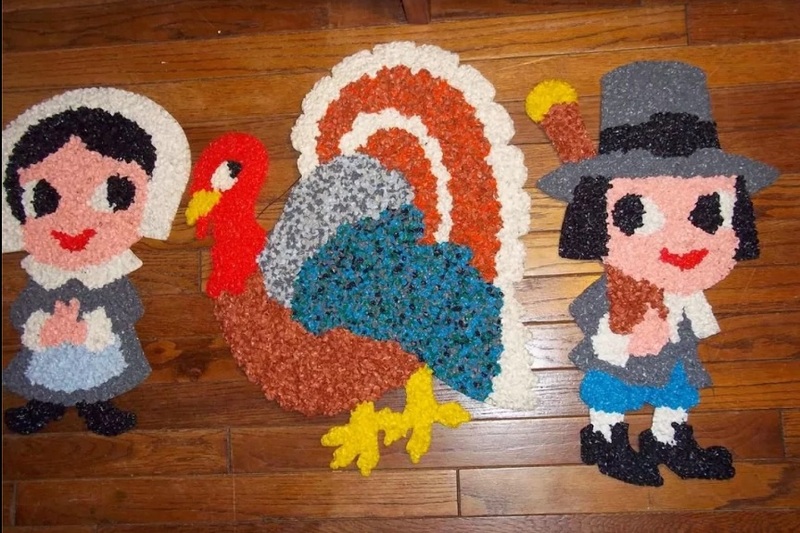 There are melted plastic popcorn decorations for all the holidays: Christmas, Easter, Halloween, Thanksgiving, Valentines and even melted popcorn decorations just for the fun of it. Snoopy, Tweety, The Road Runner, Pink Panther and Betty Boop have been immortalized in vintage melted popcorn plastic. A complete list of ALL the melted plastic popcorn items seems to be unattainable. The prices range depending on the rarity of the plastic holiday decoration. They are designed to hang flat on a wall or door and the sturdy plastic stands up to tough weather conditions. I grew up in a melted plastic popcorn home. Every Christmas season, these decorations hung in our windows, including Santa Claus (both in a sleigh and standing with a tree, as seen above), Rudolf the Red Nose Reindeer, a few snowmen in different poses, and Christmas trees. It would not have seemed like Christmas without these cheerful decorations (also the window clings that went in the bathroom window every year. My mom doesn't do anything in the house without knowing how it will affect Christmas decorating). Mom also had pilgrims and a turkey in our front windows every Thanksgiving. I loved them so much, that my mom gave them to me when I moved to Chicago, ostensibly so I could feel closer to home. It meant all the more to me knowing how much she treasured them. Since then, I've obtained several ghosts, witches and black cats for Halloween, a few red hearts for Valentine's day, and even a flag that I can use for Memorial, Independence, and Veteran's Days. While not quite an obsession, I do love these things. I'll probably collect more along the way. You can never have too much popcorn. This was all I had to go on; there is no date on the photo, but there is an engraving in the matte that states the photo was taken by E.E. 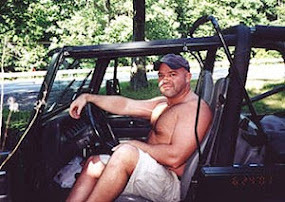 Conrad, the leading photographer of his day in Meyersdale, PA. Upon discovering the photo, my mind boggled. Who was this dashing man with the very familiar eyes? Where did he live? What did he do? What was his story? In an almost obsessive state, I set out to try to find the answers to these questions. My father's genealogical history was murky. I've discussed it before on here. Most of the older generations passed away while my dad was still young. He mostly only knew nicknames of people, not their legal names. And their relationships to each other were incestuous at best. By that, I mean that there were two families that intermarried several times down the line, where the siblings of one family married siblings in another family. This was not an altogether unusual practice in the 19th and early 20th centuries, especially in small, rural/farming communities. The pickings might be unfortunately slim; your nearest neighbor might live a mile away; your schoolhouse might have 10 kids ranging in ages 6 to 14, five of whom are your own siblings. But after more than a dozen years researching both my parents' respective family trees, pouring over census records, visiting cemeteries, connecting with genealogists, researching ancestry websites, and submitting for copies of birth/death/marriage certificates, I have successfully researched the trees back 14 generations. The farthest person I have found is Collin McKenzie, born in Cromarty, Scotland in 1630. Oddly enough, both my father and mother's lines descend from this man and his wife, Isobel. But that's another blog to be written later. 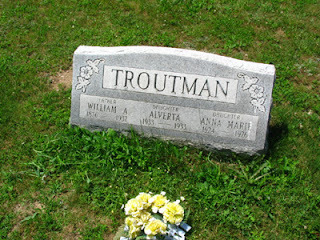 Out of the 14 generations, I place William Amos Troutman in the 6th generation (our new two great-nephews are the 1st). The first thing I learned about William was that I couldn't find any information on his parents or siblings. There is no birth certificate on record for him. So it took reading several censuses and obtaining a copy of his death certificate to put it all together. Amos Troutman and Mary Rickard (or Richard or Reichard) had a tryst in 1876, with William being the illegitimate outcome. I know Amos and Mary didn't get married because Amos is listed on the 1880 Census as being single and living at home in Southampton, PA. The 1880 Census also states Mary, still listed with her maiden name, as living with her parents, Jacob and Mahala Rickard, in Larimer Township, PA. Also in the Rickard household was a 4 year-old William. It would seem that William was born out of wedlock in 1876 when Mary was 18 and Amos was 20. 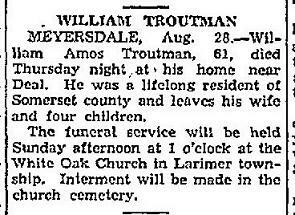 What is also interesting is that they (or she) named the baby William Amos Troutman. The name "William" is prevalent in Amos' family line: his father, grandfather, and great-grandfather were all named William. Therefore, baby William Amos was named after his father and grandfathers. I find this odd since the couple didn't marry. The romantic in me wants to think that Amos and Mary wanted to or perhaps planned to marry but were forbade. Although the realist in me believes Amos didn't want to marry Mary and she named the baby after his father and grandfathers out of spite. At this point, Mary disappears from the history books. Amos goes on to marry Isabel "Belle" Bluebaugh in 1882. They had 9 children together. I have no information as to whether William and Amos ever stayed in touch or if William even knew his half-siblings. They all remained living in Somerset County in PA, however. I am guessing the photo of William above was taken around 1900 when William was 24. I can't think of a reason why he had the photo taken as he was not a professional. As there was no national census between 1880 and 1910, I can only assume he was a laborer all his life. He could neither read nor write, except for signing his name. 1908 - Married Cecelia Agnes Winebrenner on January 28th. She was from Mt. Savage, MD. I'm curious what brought William to MD to find a bride, not to mention one so young. On their wedding day, William was 31 and Cecelia was 16. They shared their wedding date with her father, John E. Winebrenner, and his second wife, Julia. A photo of the big event is below, with William and Cecelia on the left. Everyone looks so happy, don't they? 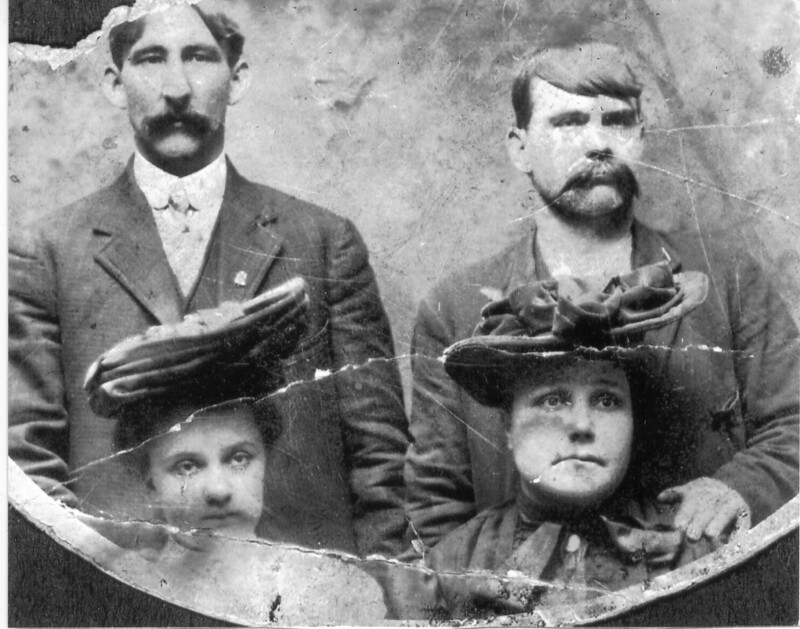 1910 - William and Cecelia were living in Mt. Savage, MD, along with her brother James Winebrenner, listed as a boarder in the household. At this point, William was a laborer with the County Roads Department. 1918 - William, at the age of 42, was issued his WWI draft card. He was not activated to service. 1920 - William and Cecelia were living in Frostburg, MD, along with 3 of their children, Mary, John (my grandfather), and Frances. At this point, William was working as a coal miner. 1930 - William and Cecelia were living in Larimer Township (William's hometown) in a house he bought for $250. John and Frances were still living at home. William was working as a trackman with the railroad. William Amos died on August 26, 1937, at the age of 61 - two years before my father, his first grandchild, was born. According to his death certificate, William died as a result of carcinomatosis (cancer in his stomach, liver, and lungs). Cecelia was 45 years-old when William died and would remarry. Contrary to what is written in William's obituary, he was not a lifelong resident of Somerset County. Per the obit, William is buried in White Oak Church cemetery in Larimer, PA, sharing a tombstone with two of his children, Anna Marie and Alverta - both of whom were complete surprises to Dad, Mom, and my sister when we visited the cemetery for the first time in 2005.